Free ranging your chickens is a wonderful thing for them. They can wander around all day, eating up a variety of goodies they have found in your lawn, gardens, and under the trees. Free range chickens rarely suffer from boredom and they typically have stronger immune systems. All good things, right? But what about those free range chickens that live where winter hits hard? Where do they range? 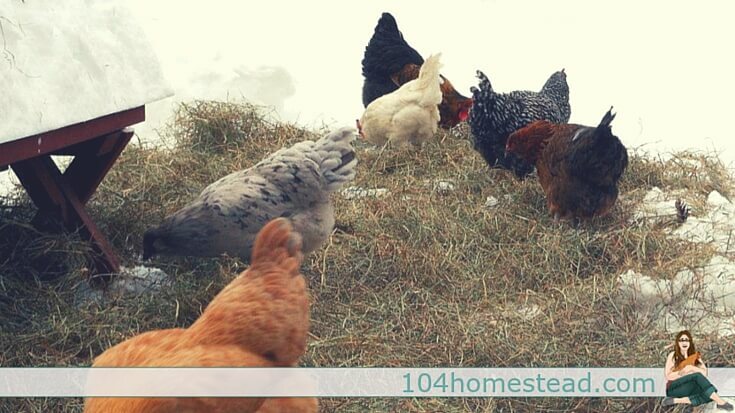 If you have a small flock, it’s easy enough to shovel away the snow in a small area for the chickens to graze. You can even snowshoe little paths for them (something my kids and I have done in years past). However, the larger your flock is, the harder the task of supplying adequate space becomes. Space is just as important in the winter as it is anytime of year, maybe even more so. 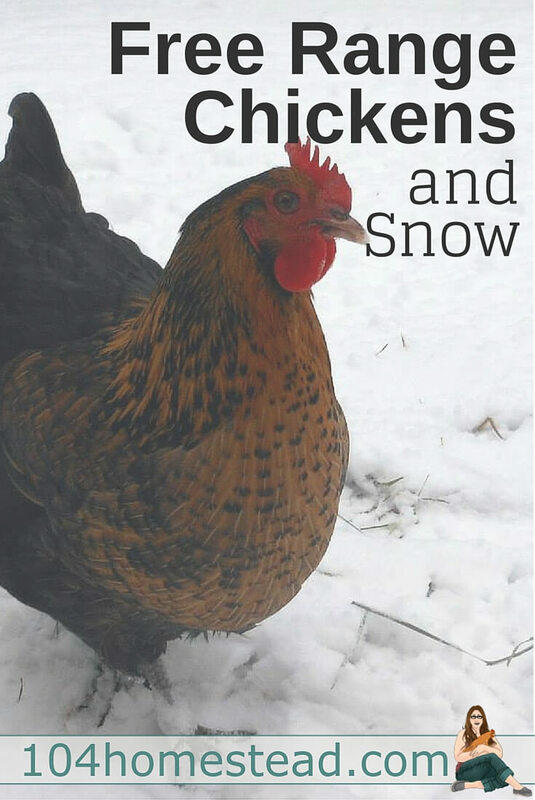 If your chickens spend more time in the coop during the snowy months, it is vital that they have room to spread their wings when they go outdoors. So this year I have more than twice as many birds, no polytunnel, and the snow has started falling (you can hear about my girls’ reaction to it on Facebook). The way I see it, I have a few options. I can choose to shovel of snow blow a large area. I’ll be honest, the idea of shoveling that much space is far from appealing, but a farmer has to do what a farmer has to do. Snow blowing is a bit better (since it’s faster and easier on the arms), but remember, the worst snowfalls always seem to be at night and these chickens want out at the crack of dawn. No one wants to feel rush to get out of their jammies to deal with snow. So, shoveling and snow blowing will work, but neither is ideal. So you have to deal with the driveway anyways, why not let the chickens range there? Since I live in the village and my mailbox is right by my front door, I have until 9:30am to clear my driveway or I don’t get my mail for the day. Since I have to take care of the snow there, it makes sense just to let the chickens out the front door of the coop and let them hang out there. Well, there are a few flaws, but they don’t make-or-break this plan. First, my rooster seems to take issue with the mailman. When the rooster has the whole yard, he leaves the poor man alone, but in the confined space of the driveway, this could be asking for trouble. Second, chickens like to perch, especially when the ground is chilly on their feet. I prefer they not perch on the ski rack of my car. Third, what chicken poop is not smeared down my car windows ends up on the deck, walkways and all over the driveway. This means when you take off your snowy boots in the entryway of the house, it melts into a yucky poopy puddle. No thank you! So driveway ranging is an option as well, but has some stinky flaws. A temporary structure might be the best option for your free range chickens during the winter. You can use a tarp, plastic, canvas or even plywood to create a “roof” over an area. The larger the flock, the more work and cost involved in this system, but once it’s set up, it requires little maintenance. Just be sure you account for snow load, clearing it off regularly or making sure it has an adequate pitch. So a temporary structure requires little work once it’s in place, but there is cost and maintenance to consider, as well as a risk of collapse. If you have other livestock on your homestead, their grazing area might be a good place to range your chickens, even if you usually keep them separate. Cows, horses, pigs and even goats seem unfazed by snow and they make quick work at clearing large areas. You may have even trudged a path between the coop and these livestock pens already. Tossing down some hay on the path and allowing the chickens to mull about in this cleared area might be the best free range option. Everyone who maintains a farm during the winter knows how hard it can be to provide thawed water to their critters. This task is even harder for those of us who free range our birds. You cannot use water heaters in uncovered areas. Water heaters must be kept in dry conditions. That limits you to the coop if you don’t have a run, which isn’t ideal since the moisture from the warm water can create respiratory issues with your birds. You also can’t identify where your birds will choose to range. You may have cleared a great area for them, but they have decided to range in the treeline. Keep an eye on your birds on cold days and make sure water is provided in the areas they are spending their time. Often if you located water near their food, they will access it. I like to use these rubber tubs for my chickens and ducks during the winter because you can kick out the ice blocks without damaging them and the black keeps them thawed a bit longer than with other containers. 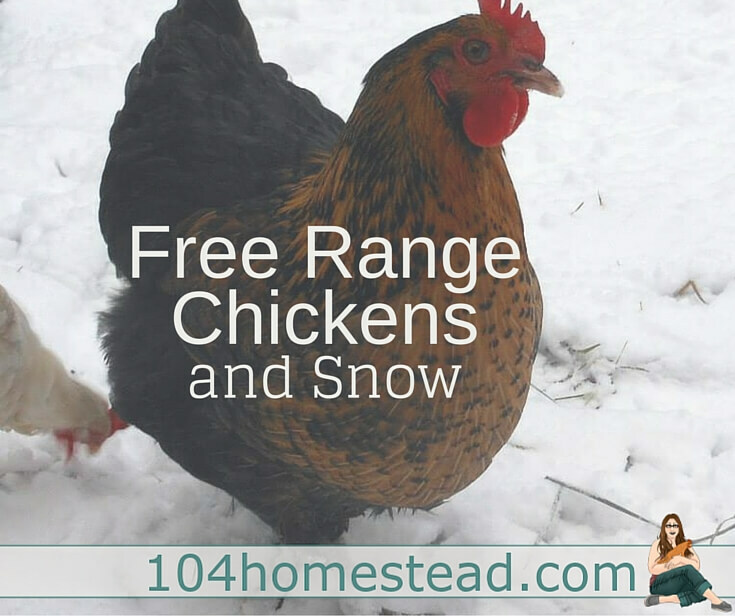 Free ranging your chickens in a snowy climate is definitely doable, but it does take a bit of planning and certainly more work than confining your chickens. Don’t wait until the first snowfall like I did. Plan ahead so you are prepared. Happy winter! We only have one free range rooster, left from the previous owners. He chooses to roost and poop anywhere he wants. Should we enclose him or try to train him to roost somewhere else? A few nights contained in the coop should teach him where to go at night. We had to quit free ranging our girls in the winter because we were losing them to predators, mainly hawks. Seems like there are fewer other “prey” out and about (field mice, bunnies, snakes, etc.) and way less cover brush for our hens to hide under with all the branches bare for winter. They will sure be glad when spring arrives. We have had to come up with ways to keep the entertained in their run (food dispenser toys, swings…..) all winter. I know people tend to worry, but they really are hardy. They have the best down jackets that money could buy. Last fall my husband built a wonderful small shelter just outside their coop so that the chickens could go outside. It’s basically just a roof that keeps most of the snow off the ground underneathe it. It worked great! The problem I have now is that or flock is way bigger this year! But I found even last year that if I threw some hay down on the snow around the roof that they would go on top of the hay, so long as their feet weren’t actually touching the snow they were fine. As for the water we just give them snow as soon as the temperatures stay below freezing 24/7. It has worked great and we have had healthy chickens. I consider winter the ultimate workout here in Colorado. When it snows, I shovel the “Doinktona 500” (named for my pig Doink) in the barnyard. It’s a long, circuitous path. Next time it snows, I shovel again only a little bit different path. In the end, the chickens, goats, alpacas and pig have wandered all over the barnyard and I have no need to go to a gym! Good for them, good for me! That must be really cute. My boys go out in snowshoes and pack down a path for the birds. They follow my oldest around as he trudges. 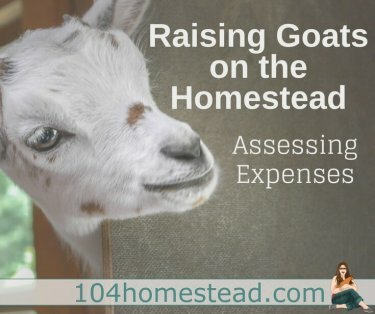 I always say, you don’t need a gym membership if you’re a homesteader. Perfect timing for this article! Lol! I just got my woolies on to go move snow away around my hen house! Going to put a plywood awning off the side where their little door is, and put down straw underneath. I’m up in Northern Alberta so my flock does end up spending much of winter indoors unfortunately. Last winter they were pretty squirrely! I really enjoy your sense of humour on your blog, by the way. New subscriber. Love your article, made me laugh, hubby would have a fit if the chickens went on top of the car, good thing we don’t have a rack!! I have seen the turkeys on the bucket of his tractor, very funny! When we have lots of snow the chickens won’t come out of the coop so they don’t free range much in the winter. Hubby even plows in front of the coop but they won’t be enticed till the white is gone. We have a 12X12′ coop with two overhangs that have hardware wire on them. So they do go there for dust baths and fresh air. We had our first snowfall yesterday and will see if the newly raised chicks from this spring will come out! Should be fun to watch, they are very entertaining. Only getting one egg a day now! Don’t laugh, I have 40 hens!! They are all different ages and types, more eye candy than production hens! The joys of having chickens. Love all my backyard critters, have a pond so had to have a pair of ducks, what a view, they will go on the pond as long as hubby breaks up the ice for them. I’m so glad you enjoyed! I’ve been known to go out an remove evidence that the birds have perched on my husband’s car before he sees 🙂 I totally understand about chickens being eye candy sometimes. We use supplemental lighting, but still average 5 eggs from 14 hens, so a few of ours are eye candy as well. They are just too funny to part with.